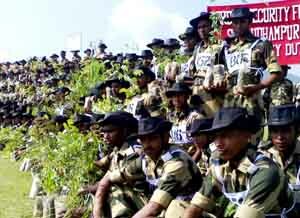 BSF personnel posing for photograph during a plantation drive at STC Udhampur on Tuesday. JAMMU, Aug 19: In order to launch the plantation drive in all BOPs and Headquarters spread in all over India under “My Earth My Duty” week, BSF today organized a plantation drive in Samba and Udhampur areas. During the campaign, about 2 lakh saplings were planted at various establishments of BSF across the Country simultaneously in just 30 minutes time from 10 am to 10.30 am. This effort of BSF will be endorsed in Limca Book of Records. 9 Battalion BSF, Samba under this drive organized a campaign at Battalion Headquarters Panjtilla, Samba. During this programme MLA Samba, Yash Paul Kundal was chief guest who started this plantation drive by planting one tree with his hands. Jawan of BSF and their families participated in the programme with zeal and vigour. On the occasion, OP Upadhyay, Commandant, 9 Battalion BSF, addressed the gathering. About 550 plants were planted at Battalion Headquarters and 605 plants at BOPs by the troops of the Battalion. Meanwhile, STC BSF Udhampur also planted 2100 saplings in and around surrounding area of STC BSF Udhampur. The plantation drive was inaugurated by Balwant Singh Mankotia, MLA Udhampur in the presence of J C Singla, Deputy Inspector General, STC BSF Udhampur. At the onset of the plantation drive a cultural programme focusing importance of trees and to refrain from their cutting and poaching was presented by recruits and troops of STC. In the campaign 1375 personnel of STC and their families participated. Balwant Singh Mankotia and J C Singla along with his team of officers also planted the saplings. The chief guest was presented a unique memento in the form of a plant by DIG, STC BSF Udhampur, with a request to plant it as a memory of campaign leading to Limca Book of Records.